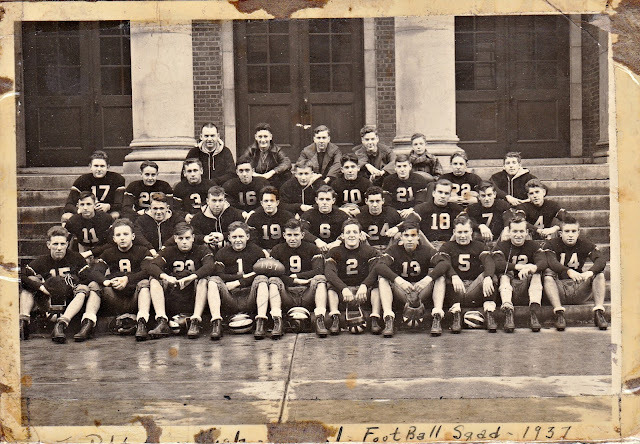 Throwback Thursday "Football Team in 1937"
As I looked through my old photographs, I found this amazing shot of my Uncle Al (#2) from 1937. Yes, 79 years ago! This photo was in such great condition, I was really amazed. With the Super Bowl coming up, this just felt right to show you! I am not a football fan myself, baseball and tennis are more my speed. I love their shoes, helmets and outfits! My Uncle Al looks so handsome in the front row. He loved sports, and always was watching some sport when he visited my house. He was such a great, fun-loving guy - I miss him loads. He would love to have his photo here on the blog to show to all of you!